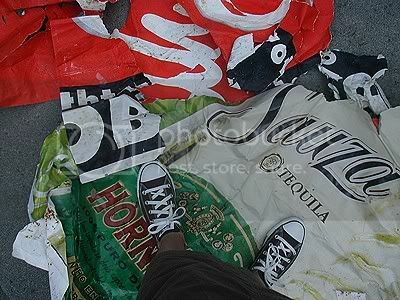 what happens to all the old billboard paper??????? The time to go billboard collecting is after major rainfall. Sometimes they'll just have peeled themselves and be lying there on the ground waiting for you to scoop them up whole. I once caught a billboard repairman filling up his truck and he was more than happy to give me as much as I wanted. Old billboards go into storage at the plant. When they have enough for a large truckload they haul them away to recycle. I've been eyeing this one pile for years now but it's behind a barbed wire fence. oh!!! what a great score...to actually catch the repair guy. and yah, the rain fall makes sense, cuz we were drenched about a week ago. and good luck getting that stash behind the barbed wire fence. i'll bet if you found out the property owner..they might scratch their heads a bit..but, they'd gladly let you take it off their hands. The fenced in property is the billboard company! But yeah, maybe honesty is the best policy.